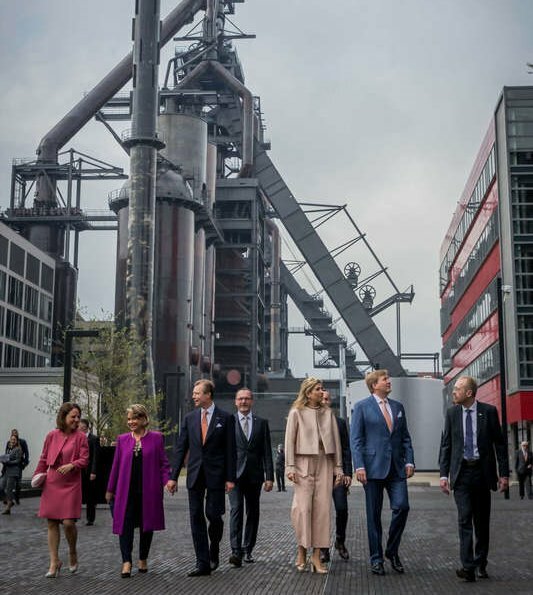 On the second day of their state visit to Luxembourg, King Willem-Alexander and Queen Máxima began the day with a visit to Belval which has been converted to a science, life and working region with urban transformation projects. 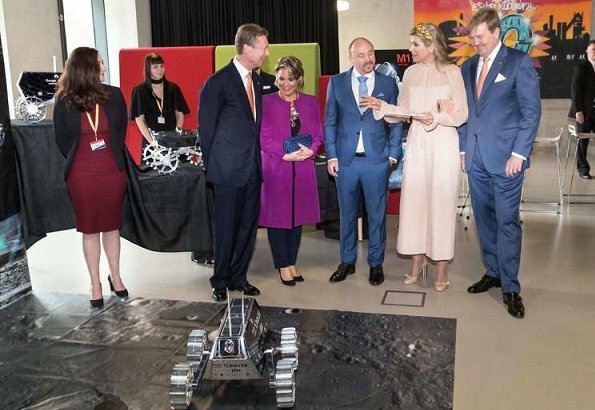 After visiting Belval, the King and the Queen attended the opening of an exhibition at Vianden Castle (Buerg Veianen). 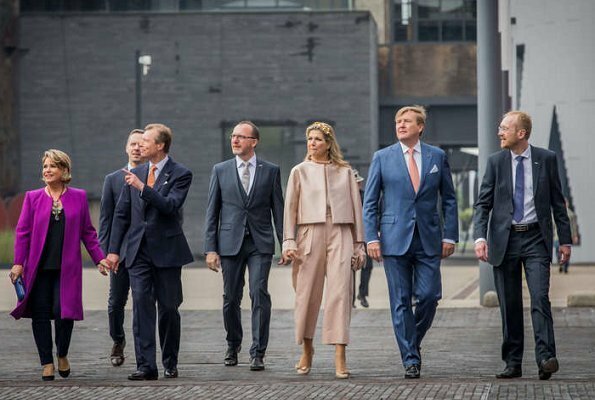 In the afternoon, the King and the Queen attended a meeting on sustainable economy at the Chamber of Commerce. 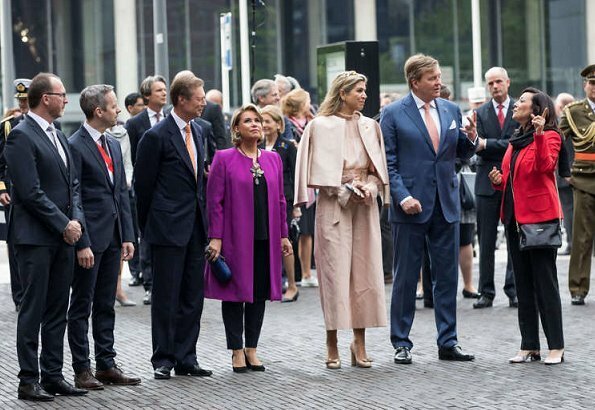 In the evening, the King and the Queen will hold a concert and a reception for the Grand Ducal Family. This is such a nice way of wearing 'les culottes'. The GD's coat has a good cut for her figure, maybe a tine little bit too long. The two gentlemen in their well fitted suits and not worn to death shoes are looking good too. Love the pic on the stairs. 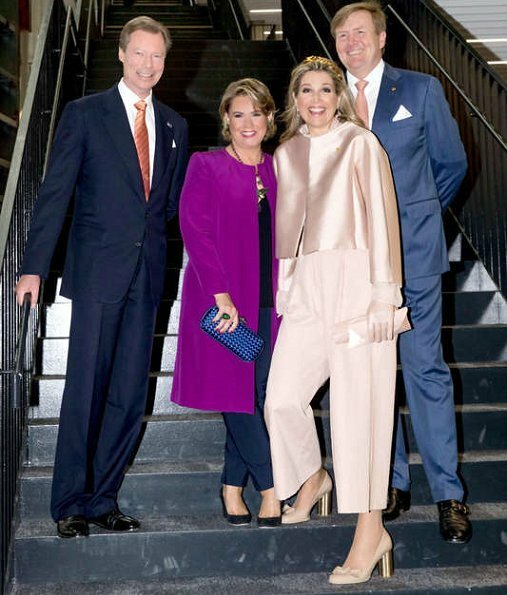 Love how Queen Maxima is half on the lower step in the second to the last photo so she's not towering over the Grand Duchess. Great photo! Maria Theresia looks so fresh and young in this outfit, suits her very well! And hand in hand with her husband, that's rare to see on the older generation of Royals! Maxima looks stunning too, but I don't like that thing on her head. I too think it's great they hold hands. I don't understand why the British royal family thinks showing PDA is unprofessional. All the other royal families don't seem to have that opinion. I think it shows the couple as a loving team working together for their country. In my opinion the haedpeace is the perfect answer to all the comments about Maxima's "messy hair". I prefer Maxima's outfit without the jacket. Her gloves looking strange to me. I love the pictures of the two couples on the stairs. Full of happiness and joy. MT really looks fresh and young. Well said. 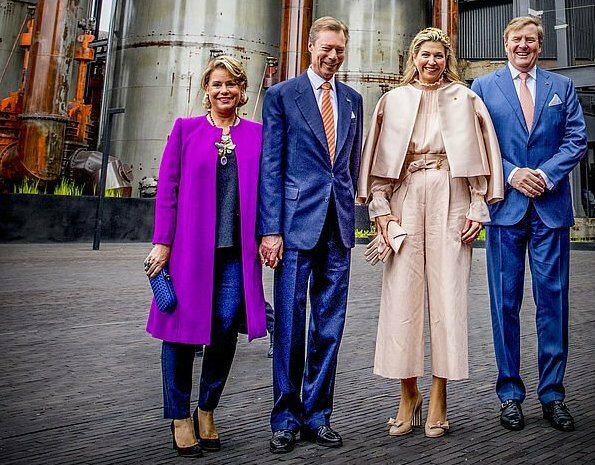 Well again a NATAN for Maxima the outfit is doing nothing for her. Maria Teresa on the other hand is super. Gisterenavond: hoe dan ook: Ze kan het als geen ander! Echt zeldzame klasse! 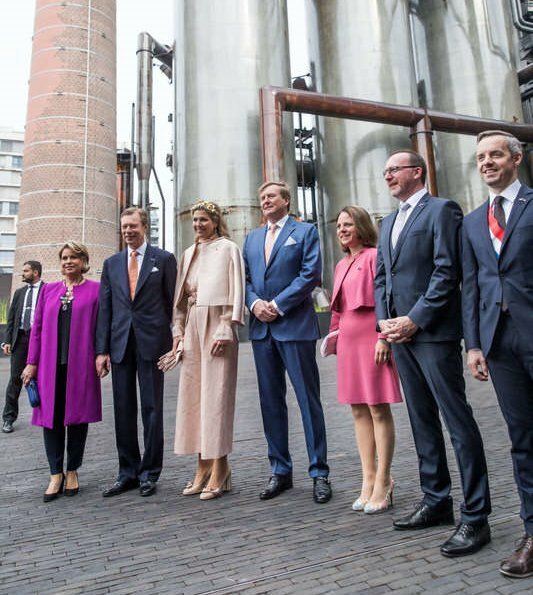 Hierboven: die broek, afgrijselijk. Wat een blunder. Op naar de kledingbak. A total fail of Maximas outfit from head to toe. Starting with the uncombed hair, the useless headpiece, the joker necklace, the shiny jacket, the fluffy sleeves (the blouse alone may look nice with different skirt or pants), the gloves? ?, the boxy wrinkly pants, down to the akwardly round shaped golden heel. A total win for MT's Combination of fabrics and colors. Outstanding! The coat may be a tiny bit too long as mentioned above. And I would have chosen another clutch, maybe a smooth black leather clutch matching the shoes. Interesting necklace, that we don't see enough of, but perfect length. Hair and make-up are superb like always lately. And the Grand Duke? He could go as a male model:-)) the way he wears his perfect fitting suits. They are such a great couple and I like that they show it. MT looks fabulous, except for the gigantic necklace, her outfit doesn't need any bling, but in any case I love the end result. I must be one of the few that dislikes Maxima's outfit, the pants are ill-fitting and wrinkled, the shoes are divine, but look absolutely out of place with the high water pants. What's around her waist, a belt, bow? IMO, a total fashion disaster, saved as usual by her charm and fantastic attitude. OMG !!!! What is Maxima wearing ??? Total fashion disaster !!! One of the worst outfits I've ever seen!!! Terrible !!!! MT looks fantastic! I love the colour combination and the necklace - gorgeous! I have mixed feelings about Maxima's ensemble. It looks okay when the jacket is worn properly or off, however I don't like the jacket draped over the shoulders, the pants are too wide the top half needs to be more fitted to balance out the wide legs of the pants. Pretty colour.